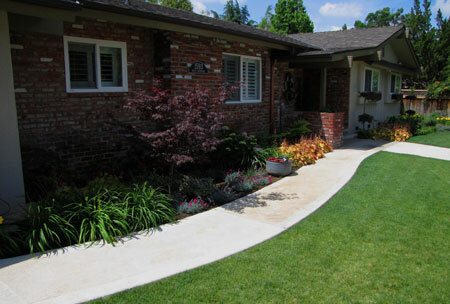 This remodel was a major renovation that removed 2 large oak trees that blocked the view of the residence, reduced the size of the lawn, converted the new lawn to hybrid Bermuda, and the flowerbeds to drip irrigation. There were some major grading and drainage issues that required removing all of the existing boulders, and cutting soil away from the house to create drainage to the street, both surface and sub-surface. 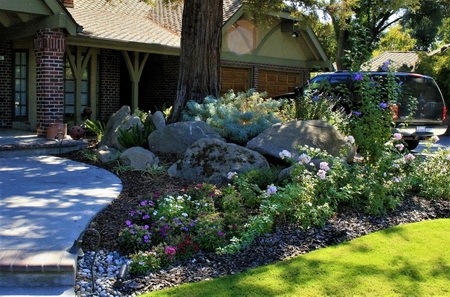 Once proper grade was established, we re-set the existing boulders, added new plant material, new sod, and drip irrigation throughout the flowerbeds with MP rotators for the lawn. 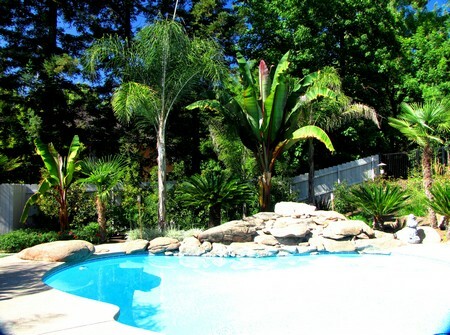 This project is an extensive remodel that includes replacement of the existing pool deck in a new design with elevation changes, design of a natural style water feature, patio cover with outdoor kitchen and fire table, spa with T arbor, landscape lighting, new plant material and pots. 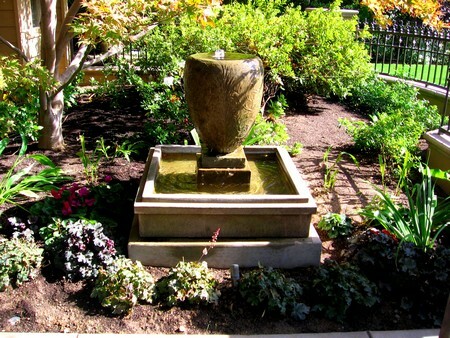 The water feature is a pondless waterfall where the water simply re-circulates from end of the stream bed rather than collecting in a pond. 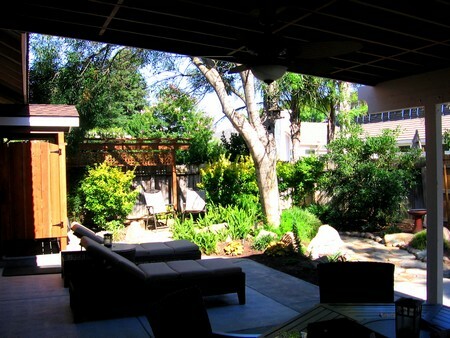 The T arbor at the spa adds a visual termination point that interrupts the view to the large backyard. The Blue Cypress on the south fence line and around the spa add unique foliage color and compliment the freeform nature of the pondless waterfall. 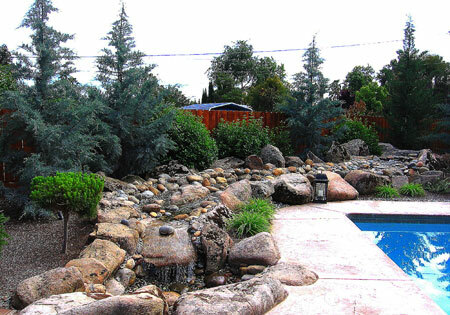 This project is a beautiful remodel that transformed the pool from a rock waterfall to a classic European look with clean lines and definition. 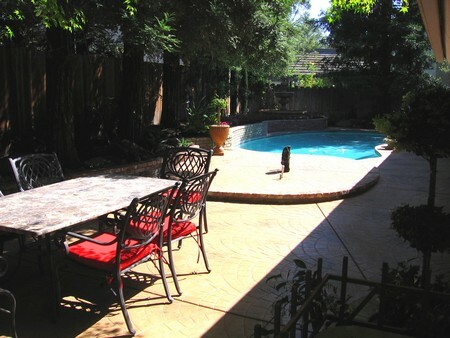 The pool deck was replaced with colored concrete and expansion joints on 5’ diagonals. 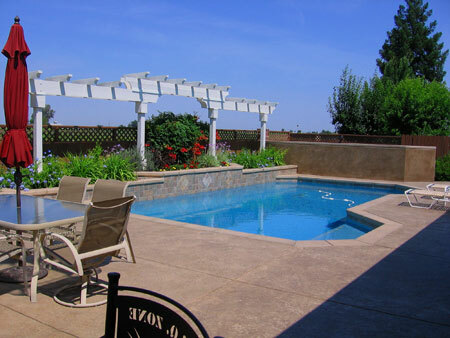 A concrete bench and pillars were added at the west end of the pool and transition into a new cabana whose architecture duplicates the roof line of the residence. 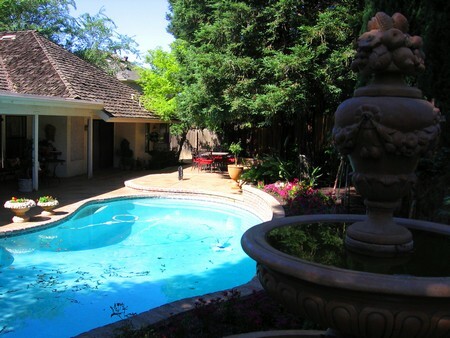 Italian Cypress in the raised planter at the pool, mimic the shape of the columns on the cabana. 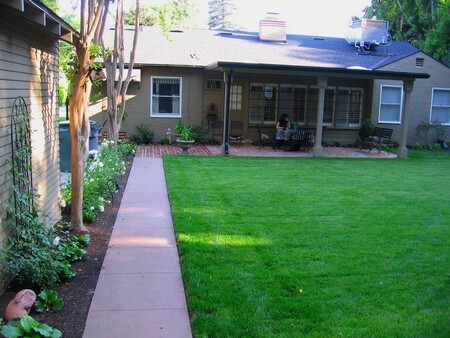 A simple remodel modified this front yard from ordinary to eye catching. 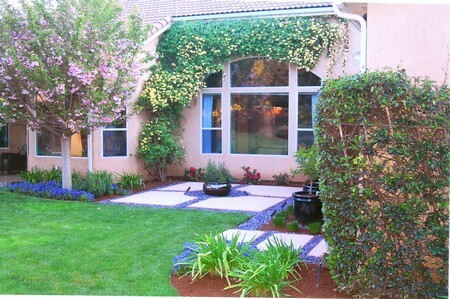 The addition of Preference roses, a boxwood hedge, and spirals, compliment the architecture and color of the home. 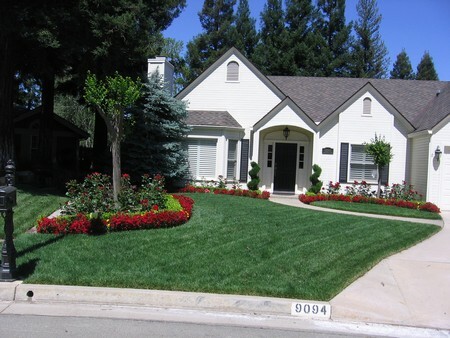 The red roses contrast well with the white paint color, and the hedges and topiary forms define the flowerbeds and entryway. 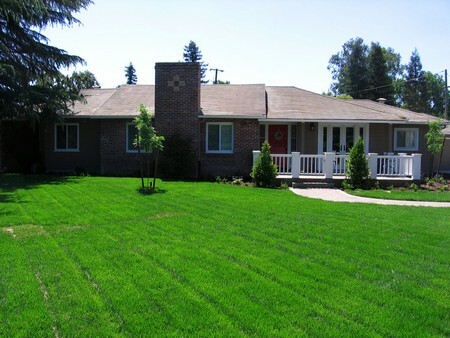 This front yard had a large lawn that sloped from the top elevation to the city sidewalk. 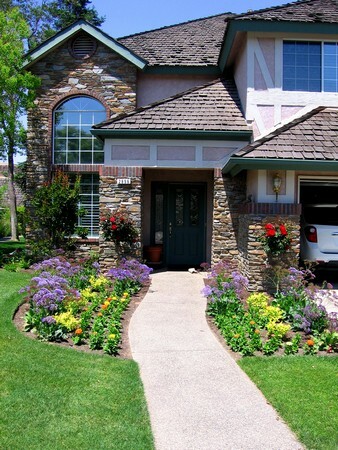 The owners wanted to modify the elevation and add a walkway from the city sidewalk to the front door. A walkway from the driveway to the front door already existed. 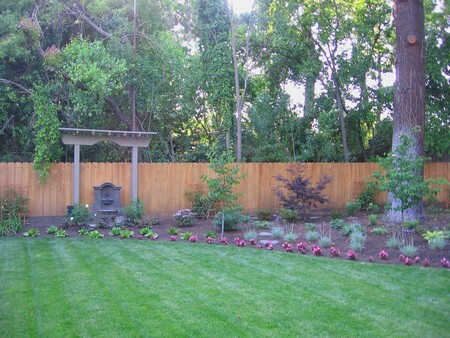 The addition of a curved retaining wall achieved the goal of leveling the front yard, making it more usable for their children. 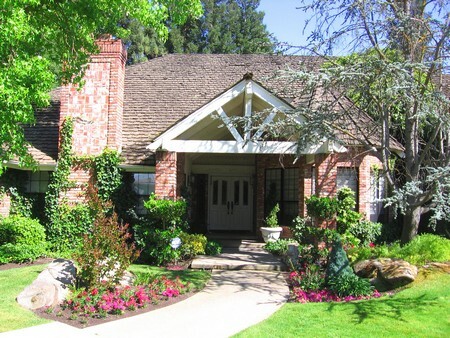 The brick cap on the wall brings simply repeats the existing brick on the house. The wide entry steps that cut through the retaining wall allow for multiple visitors to access the main walk to the front door. Lights in the wall illuminate the steps for safety. 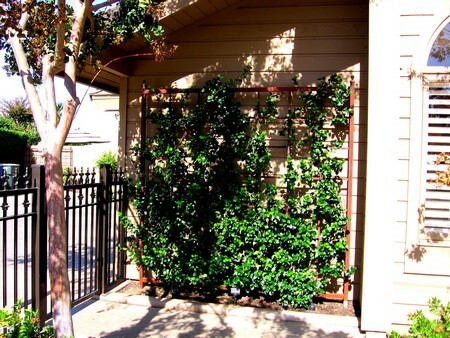 Tree roses frame the steps and add interest. 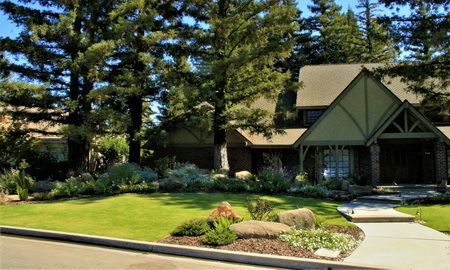 Plants added on the northern exposure of the residence include Daylilies, Coral Bells, Dianthus, Ferns, Hydrangea, Azalea topiaries, and Japanese Maple. This was an extremely fun renovation. 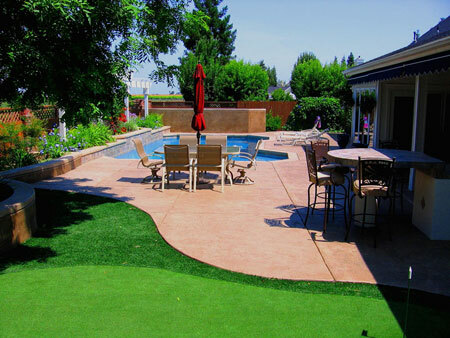 The project included design of a new pool deck, seat walls, privacy wall, outdoor kitchen with seating, putting green, T arbor, pots and plant material. 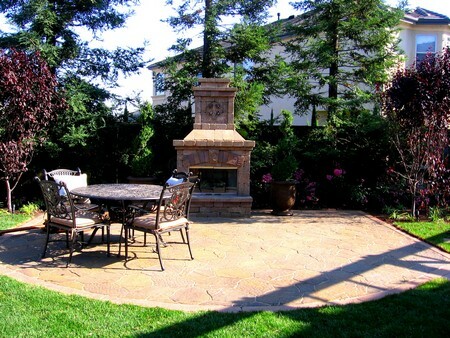 The owners entertain a lot and wanted a lot of hardscape, seating and entertainment opportunities. 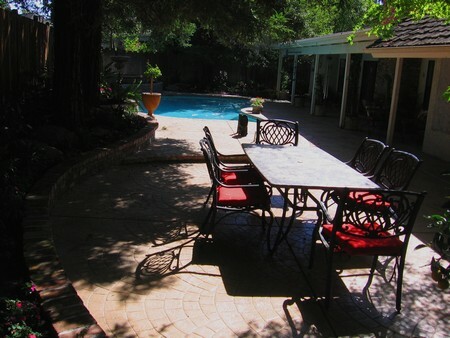 The pool deck overflows into the covered patio, outdoor kitchen and uncovered seating space. 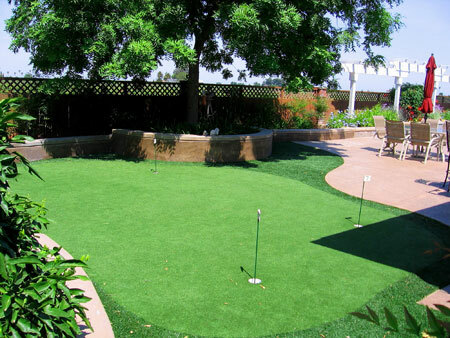 The concrete seat walls are 18” high, perfect for sitting around the artificial turf putting green. 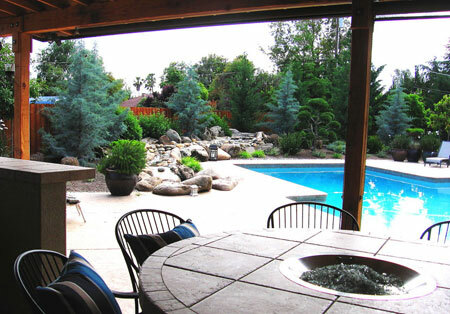 The privacy wall at the north end of the yard screens the pool and spa equipment from view and acts as a sound barrier. 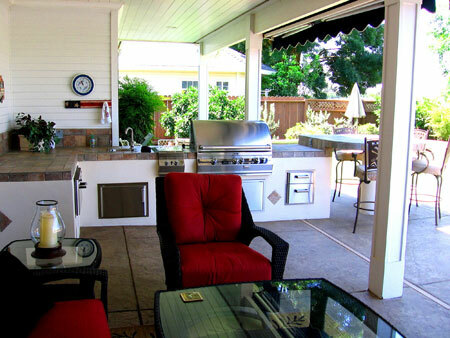 The outdoor kitchen was a challenge to design due to the components wanted by the owners-warming drawer, grill, sink, storage space, burners, drawers, and bar seating. 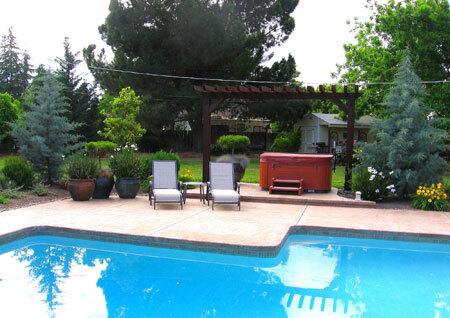 The T arbor at the west end of the pool interrupts the expansive view beyond the fence line. The original entry steps to this property were poorly designed- they went in two different directions around a central planter, and the planter interfered with the view of the residence. For this remodel, it made more sense to simplify the entry steps and incorporate raised planters to frame the view rather than interrupt it. A landing was added at the street in front of the raised planters for ease of access from vehicles. 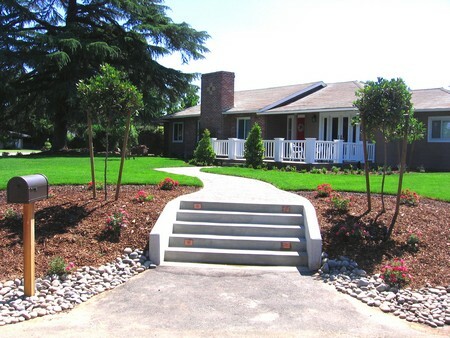 Four identical raised beds separated by a ground level bed were designed to frame the new colored concrete entry steps. An artificial stone veneer added to the face of the raised beds was repeated at the base of the wood columns on the front porch for continuity of materials. 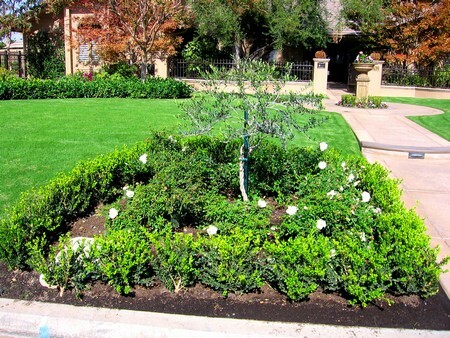 The owners preferred greenery with white for flower coloration, so Iceberg roses, white Dianthus, and cone Privet were used in the planting plan. 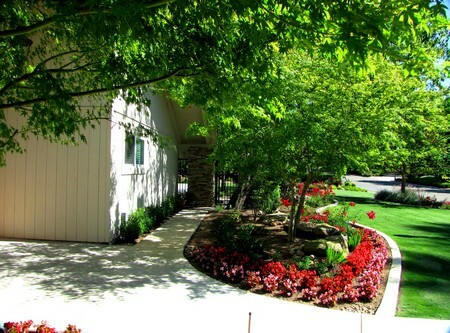 The Japanese Maples near the residence were preserved and incorporated into the new design. This property was a design/build project. 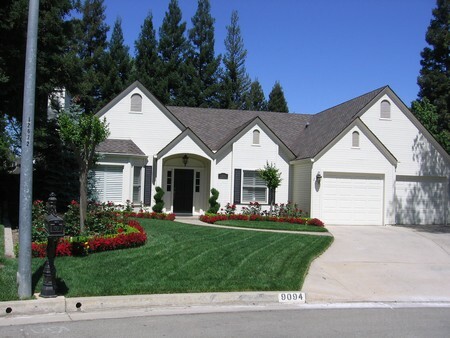 I collaborated with the owners on the design and once a basic concept was accepted, I moved on to working with my trusted landscape contractor for implementation. 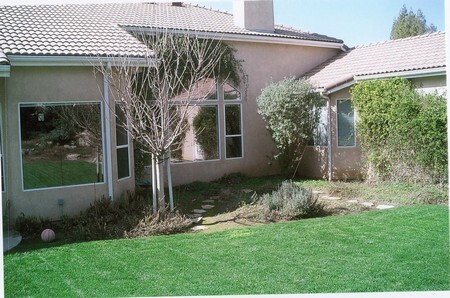 The front and side yard of this property had numerous drainage issues. 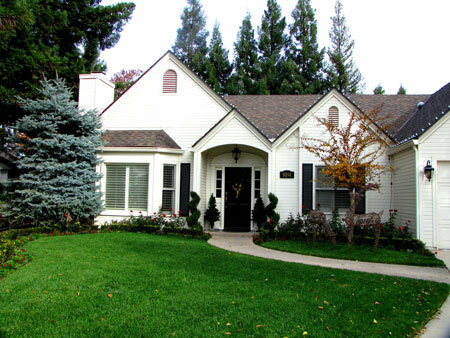 As a result, we decided it would be best to preserve the existing large trees, but otherwise start over. We re-graded the project site to establish proper surface drainage in conjunction with subsurface PVC drain lines and large catch basins. There were large boulders throughout the landscape. We removed all of the boulders and stockpiled them for re-use. The entry walk from the street to the front door was removed and replaced with a meandering walkway, wider than the original. 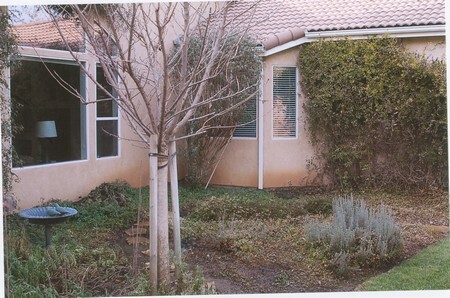 The large side yard was originally part of the front yard. 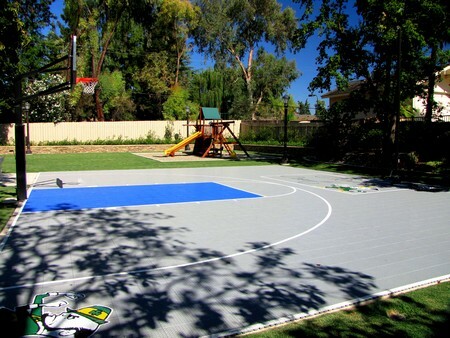 We enclosed this space with wrought iron and pillars, and installed a basketball court, seating areas, and a play space for small children. 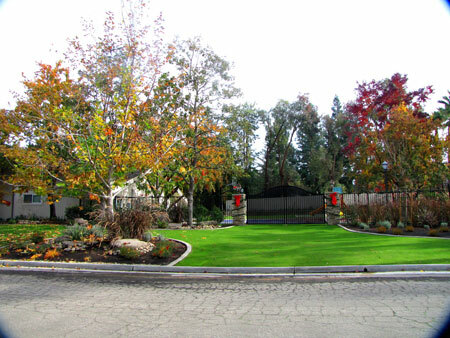 There is a turf crete product beneath the turf from the street to the double gates for vehicle access. The artificial stone veneer on the pillars was repeated at the new mailbox, and on the existing pillars at the residence for continuity. 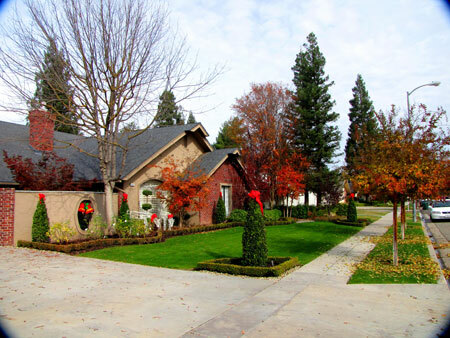 Lamp posts and low voltage landscape lighting were added throughout. 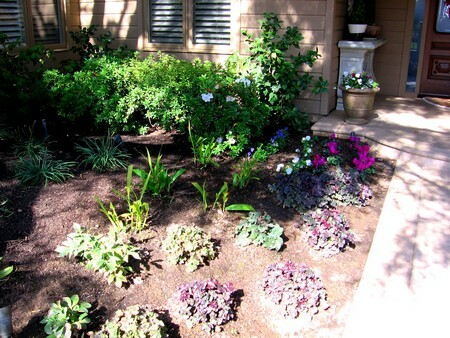 New flowerbeds and plant material were designed as part of the remodel. 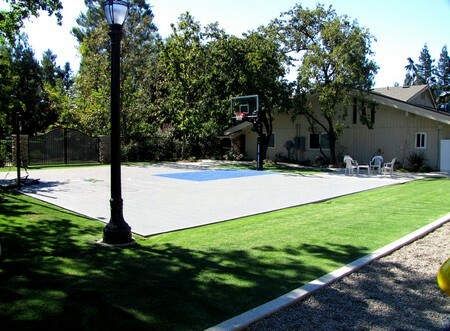 AG-1 hybrid Bermuda was used for the turf. 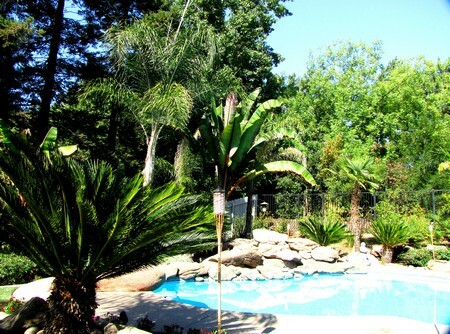 The pool scape was remodeled 3 years prior to the front & side yards, with a plan I drew. 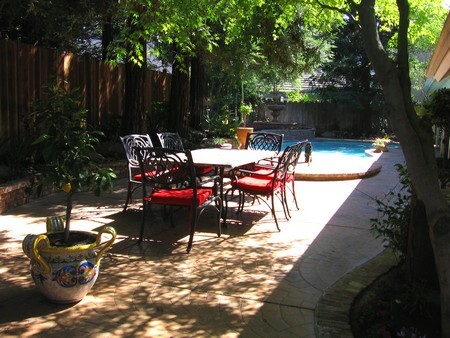 The owner of this property had contracted the demolition of the landscape, preserved the large shade tree, and installed the courtyard wall and courtyard fountain prior to our first meeting. It was really a blank slate. 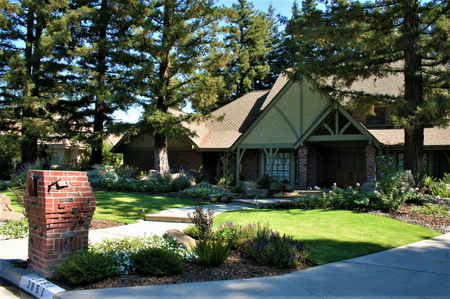 The owner wanted a formal design, with hedges and topiaries, mostly white flowers, but with soft lines and feminine qualities. 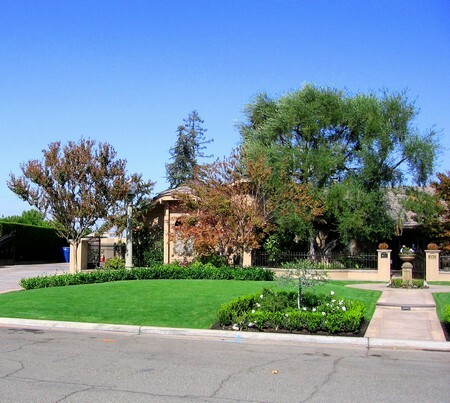 Unequal curves are designed into the boxwood hedges to soften the lines of the hedge, and add the opportunity for mass plantings of Iceberg Roses. Three white Crape Myrtle trees were added in the parking strip. 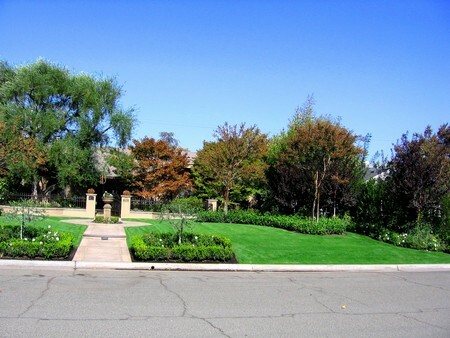 The cone topiaries centered in boxwood hedged beds, near the city sidewalk, bring some plant elevation to the street and break up the expansive lawn. 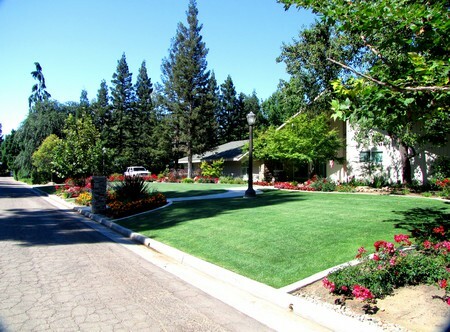 AG-1 hybrid Bermuda was used for the turf. 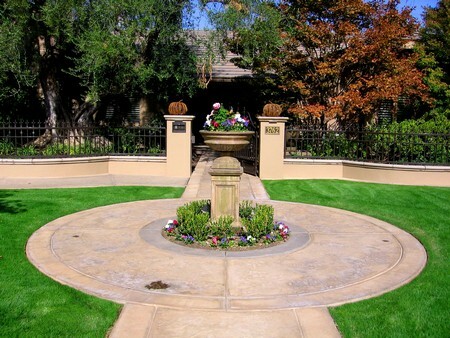 Foxtail Fern, Carolina Brush Cherry spiral, and Calla Lilies are some of the plants added to the courtyard. 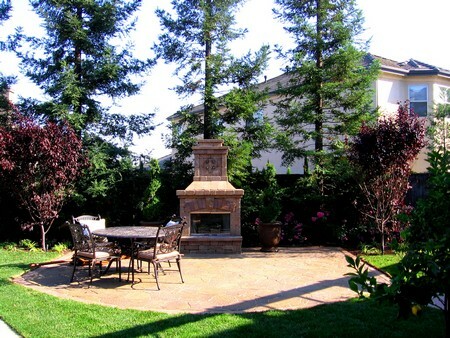 For this remodel, we removed a large section of lawn and added an outdoor entertainment space. 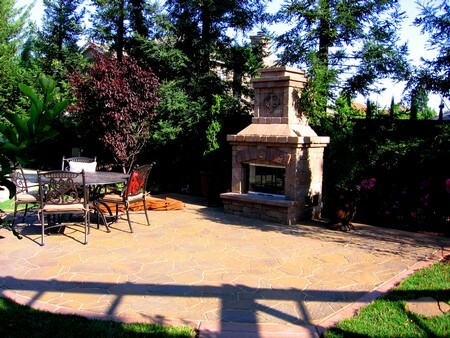 The gas fireplace and pavers are manufactured by Belgard. We added a 6" concrete curb around the patio to contain the pavers. Flowering Plum 'Purple Pony', potted 5'H Boxwood Spirals, and Liriope 'Silvery Sunproof' were planted for color and texture contrast. Low voltage spotlights were added to the plum trees. 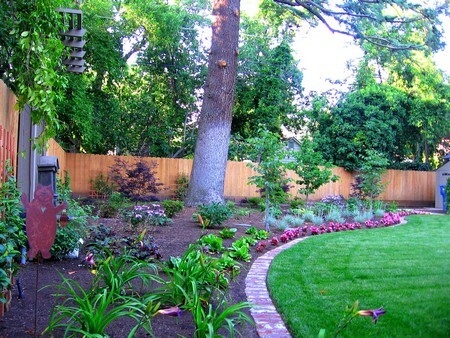 Here are some great before and after photos of the remodel of a small, but highly visible portion of a large back yard. 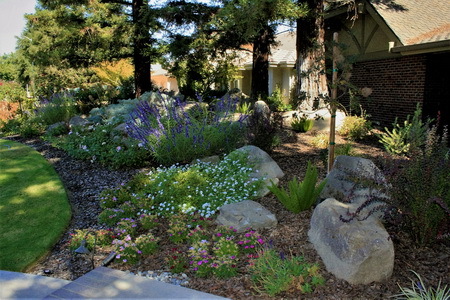 We removed some existing plant material and flagstone, modified the irrigation system, added colored concrete to match existing, added new plants and pots, installed decorative rock, and completed the design with low voltage lighting. 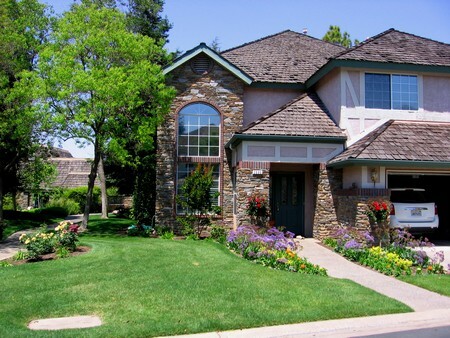 This project was a combination design/build and drawing plans. I worked with the owners & their contractors on the design & installation of the new stairway from the street, paver walkway to the front porch, and new driveway. 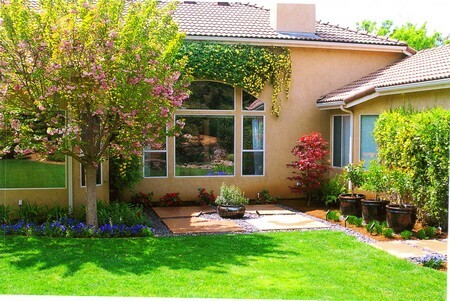 I drew plans for the planting, sod and low voltage landscape lighting. I worked for this client several years ago when she lived at another property and had the privilege to do so again at her new home. The home was built in the 1930's and she had already removed most of the existing landscape except for one Deodar Cedar and two Crape Myrtles. We regraded the back yard, added new irrigation, new sod lawn, patio cover with sky lights and power, T Arbor, fountain, landscape lights, brick lawn border and pathway, new plant material, & stepping stones. 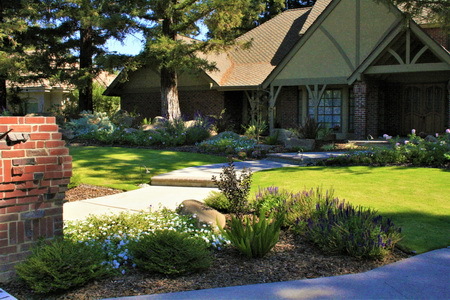 The front yard of this beautiful home had an established lawn with no plants in the flowerbeds. 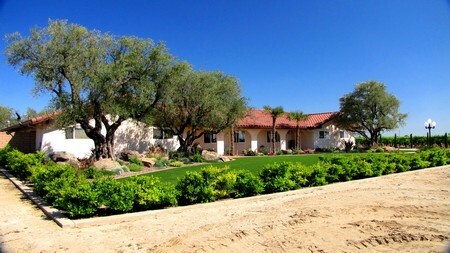 We modified the irrigation system, added drains, and added a 24" box tree and some 5 gallon shrubs. I drew a simple planting concept that the owners used to complete the planting. Stattice, 'Limemound' Spiraea, and 'Preference' rose trees, 'Mistral' azaleas, and a 'Dynamite' Crape Myrtle multi trunk will provide color throughout most of the year. 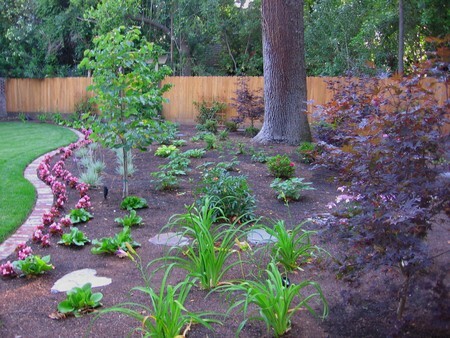 The lawn in this backyard struggled due to lack of sun from large Coast Redwood trees. 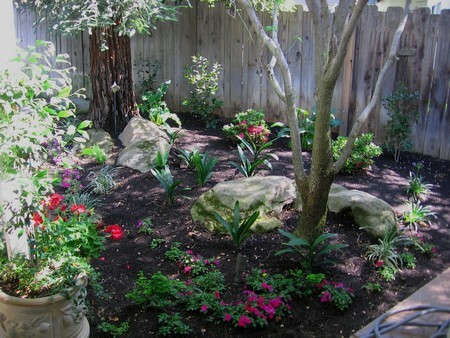 The shade allowed for some fun planting opportunities like Clivia, shade Azaleas, Camellias, and ferns. 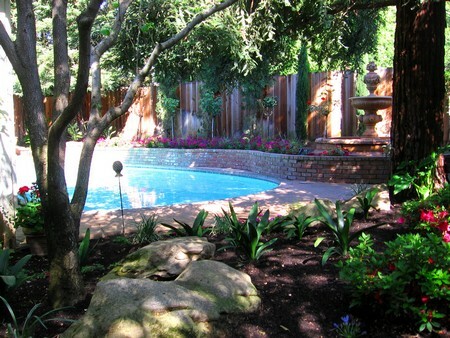 The lawn was removed and we added a second brick retaining wall that ties into the wall around the pool. 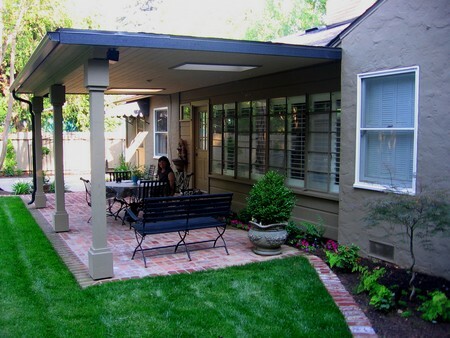 We removed and replaced the pool deck and added a brick bordered, split level patio at the former lawn. 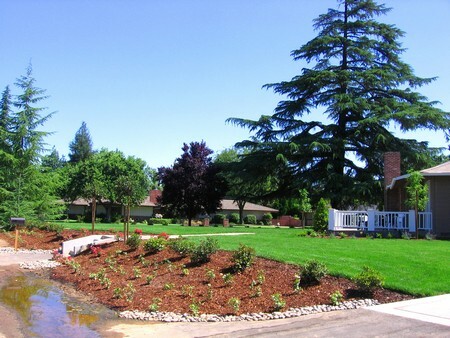 We amended the soil, installed a new drain & irrigation system, added all new understory plants, and landscape lighting. 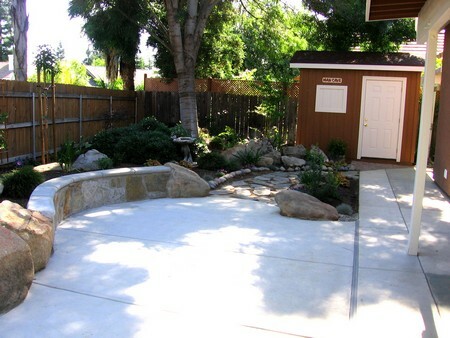 We also installed a fountain in the raised bed behind the pool. 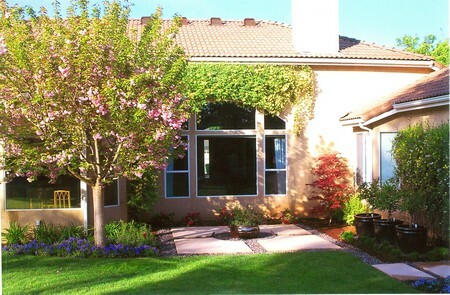 In the front yard we added a few plants and trees, and some annual color. 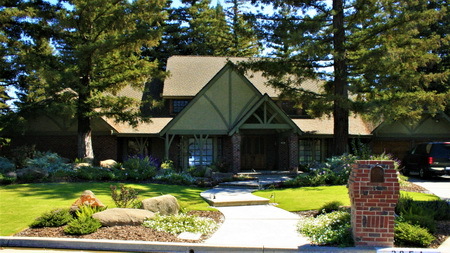 The owners of this property had recently completed an addition to their residence and were ready to proceed to the front yard. 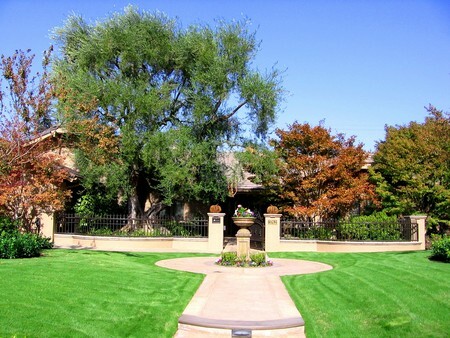 They wanted to preserve a large existing Phoenix Palm, add a tall courtyard wall, fountain, pavers, and tropical plants. The curved courtyard wall is finished to match the residence, including the roof tiles as a wall cap. 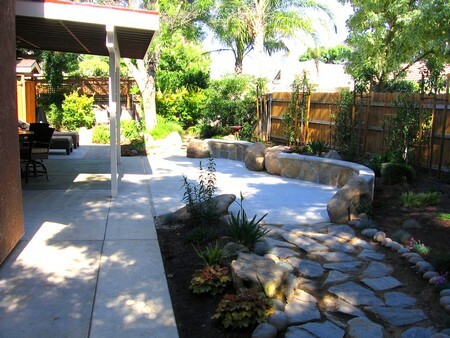 A unit paver pathway was added from the driveway to the front door, through the courtyard, and to the side yard. 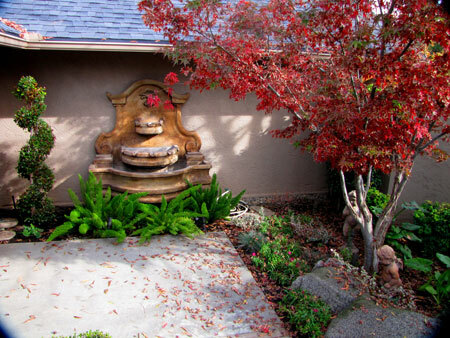 The fountain, selected by the owners, was added as a focal point in the center of the largest section of the courtyard space. 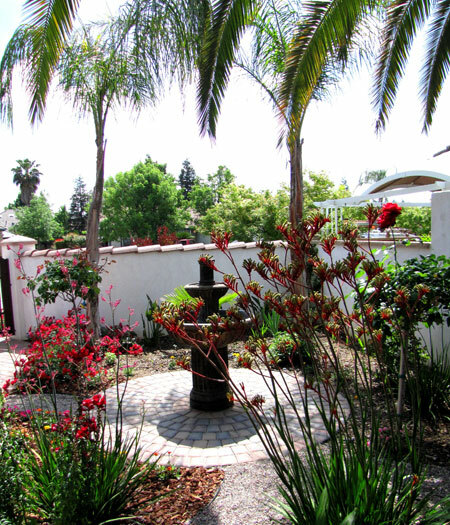 Queen Palms, Windmill Palm, roses, and Kangaroo Paw are some of the plants added to the courtyard. 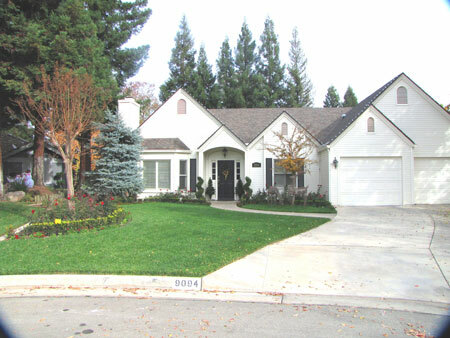 We met the owners of this property at the 2011 Fresno Home & Garden Show. 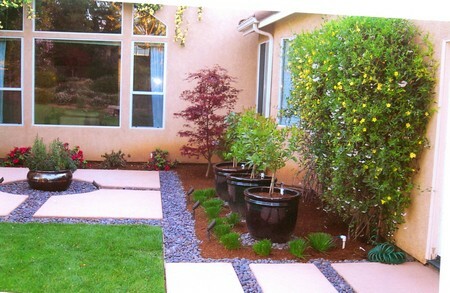 They loved the display we constructed for the landscape competition & wanted us to recreate part of it in their backyard. 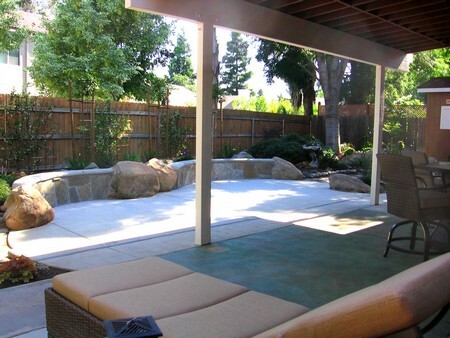 We removed some existing plant material, removed & reset landscape boulders, added a large patio and seat wall, added a patio cover, T Arbor, & outdoor shower, and installed of drains, irrigation, a retaining wall, new plants and landscape lighting. 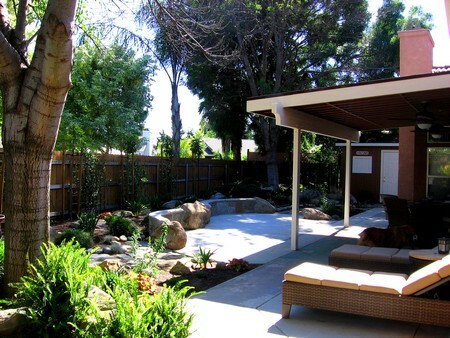 The remodel of this site occurred in 2 phases- the backyard, followed one year later by the front yard. 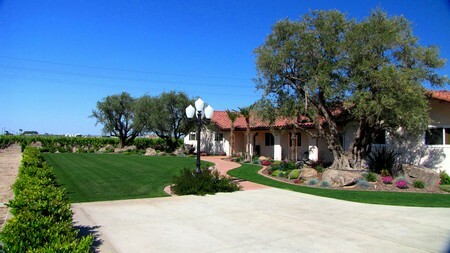 100 year old Olive trees and mature Windmill Palms were used to complement the Mediterranean architecture of the home. 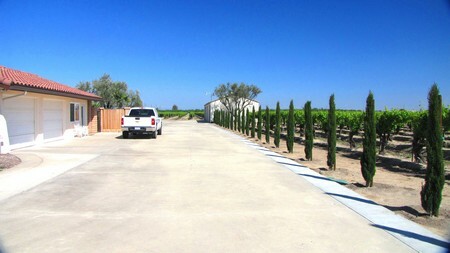 Dwarf Italian Cypress line the driveway and border the vineyard. 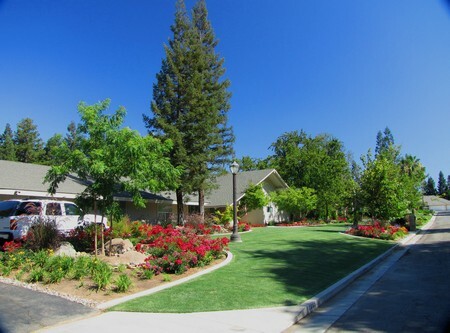 A guest parking area, new brick walkway and entry landing were added as part of the renovation. The boulders are not only decorative, but are also used to retain the soil around the olive trees. 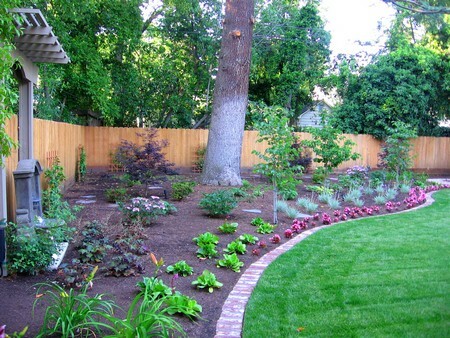 This was an extensive front yard renovation. 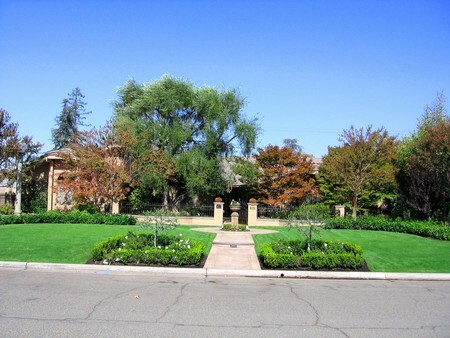 Mature Flowering Pear and Canary Island Pine trees were removed. 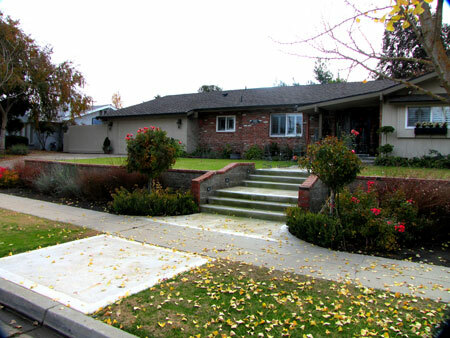 All of the existing concrete walks, driveway and guest parking was removed. Care was taken to preserve many existing plants- the trees adjacent the residence, and many mature Camellias and Azaleas. 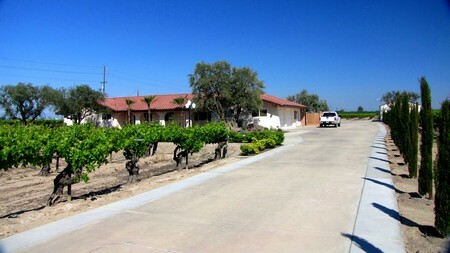 New block walls, pillars and wrought iron, with automated gates at the driveway and entry were added. 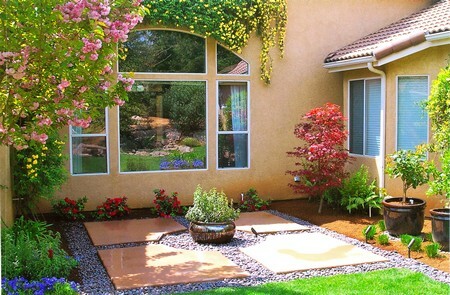 The creation of a courtyard adds privacy to the entry. 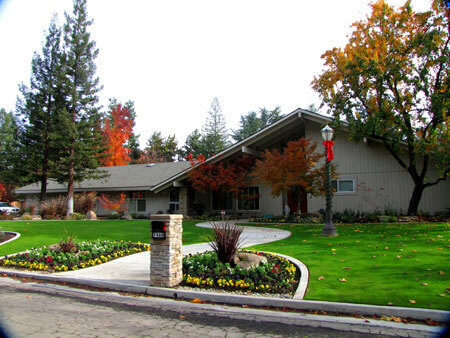 Colored concrete was used for the new driveway, guest parking, entry walk and entryway. Two mature Crape Myrtles were added to create balance with two existing Crape Myrtles located adjacent the guest parking. 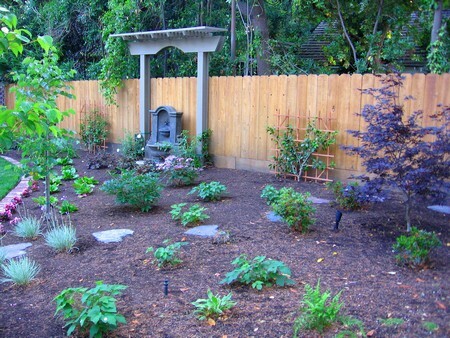 New plant material includes Star Jasmine vine & groundcover, white Flower Carpet Roses, Loropetalum, Bletilla, Japanese Iris, Liriope, Heuchera, Dahlia, Calla Lily, braided Olive Patio Trees, and Boxwood 'Green Beauty'. Landscape lighting illuminates the step in the entry walk, the trees, and courtyard fountain.